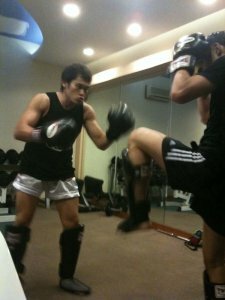 Muay Thai Trainer Singapore/ Learn Thai boxing and self defence. Sean Lee is a Muay Thai trainer in Singapore. He started practicing Thai Boxing in year 2005. Soon after his military service, he decided to take it seriously and often travel to Thailand (Bangkok) for training. His base camp is at Sasiprapa Thai gym located at Bang Kapi, Bangkok. This renowned gym was managed by retired boxer Thakoon Pongsupha, son of Grandmaster Chanai Pongsupha, since 1975. Training in this gym was old school and physically demanding, which is what Sean was looking for at that time. He believes that Muay Thai should be traditional and authentic. You need to train like a Thai and fight like a Thai. Spending a lot of time in fight camps is the only way if you want to excel in this sport. Besides training in Sasiprapa, which was his main gym, he also trains in Phuket and Pattaya. In 2007, Sean started his first ring fight in Singapore. That was his first amateur fight in which he won. He stopped competing after a few semi-professional fights and focus on teaching boxing. This was where his passion for teaching martial arts started. Of course, to be a successful fight trainer you need to learn how to teach and not just being a good fighter. Till date, Sean is still very active in this sport. He incorporates western boxing and Muay Thai training into his personal training sessions. In fact, majority of his clients are doing boxing workout with him. He conducts both 1-1 and group classes. 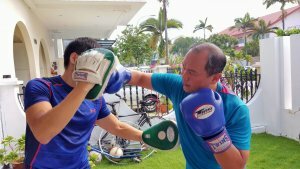 His session consists of authentic Thai boxing pad work and lots of fighting techniques which are realistic and effective. His Thai pad holding is authentic Thai style, not the typical kick boxing style. People who are into it will understand that. Very importantly, clients must be able to feel their punches and kicks landing on a sweet spot. This gives a more powerful and satisfying boxing pads training. A good boxing instructor must be able to hold pads well. It all comes with years of experience. Teaching is a totally different thing. That is why a good boxer might not be the best trainer, vice versa. What is Muay Thai (The Art of 8 Limbs)? Let us start off with a bit of history. Thai boxing exists 2000 years ago and was named Muay Boran in the olden times in Thailand. In the ancient time, Muay Boran was the simplest art form of fighting with no weapons and was used by soldiers to protect their country. It was a very respected form of martial arts practiced by the strong and brave people for combat purposes. Top Thai boxers at that time were granted the title of noble men, serving the King as elite bodyguards. Muay Boran uses the fists, elbows, knees, feet and even the head (no joke). Basically, it involves every single part of the body as weapons. Through the years, it receives huge popularity and became a competition sport during the reign of King Rama VI. In year 1921, The King build a boxing stadium in Suan Kulab College to allow professional boxers to compete in this sport. Classic boxers at that time fought with hands wrapped with rough nylon ropes. They have to go through 11 rounds of 3 min each. Total insane ! Fighters were brutal and were of very few rules and regulations. In modern times, this devastating and powerful martial art evolves into a more controlled and safer sport. More rules were created and combatants no longer fight for survival. As a national sport in Thailand, the boxing became a career and they compete for money and passion. You can easily see matches shown on TV and numerous Thai boxing fights in Lumpinee stadium and Ratchadamnern. Till now, this art form is still Thailand’s precious national cultural heritage. Countless foreigners flew in to learn this secretive art of combat. It became well known all over the world, producing many well known international fighters. It is the most popular striking method used in MMA (Mixed Martial Arts) fights. The combination of Muay Thai and BJJ (Brazilian Jiu Jitsu) is by far the most effective form of combat sports. 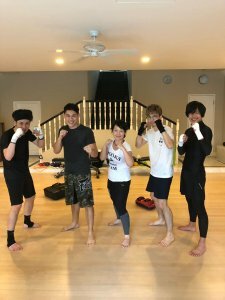 Try our Box-fit and Kick-Fit program! For those who have passion in martial arts, PT works offers you a “Box Fit” and “Kick Fit” program. This training includes all of the above mentioned points. Basically you will definitely be able to throw a decent punch and kick at the end of the day. Through the years, Sean has put together different tactics and came out with a set of principles for his program. He do not wish to train people who are bullies that use the art of boxing to intimidate others who are weaker. To him, Muay Thai is an art-form to keep fit, get lean and to use it as a form of self defence. Sparring will only be taught if one is humble and willing to learn. Pride and arrogance have to be left behind. Humility and patience has to be learnt along the way. There are many benefits that you can gain from learning Muay thai. For example, punching involves a lot of trunk movement, working on the core muscles. Learning how to kick will work on your lower body. Our main aim is to increase your muscle endurance, striking force, speed, quickness and agility. Of course, it tones your body up, losing most of your body fat in no time. If you are looking for a more challenging program, you probably have to try our fighters’ training plan. This is not for the faint heart, as it involves a lot of high intensity exercises and sparring (of course with safety protection, head gear and mouth guards). Females out there who wants to learn real self defence and lose weight, this is the chance. Don’t get intimidated, this sport is totally safe for all men and women from all ages. Besides having loads of fun, we do not compromise on safety. Injuries is the last thing we want. Recent years, Muay thai has become a huge and popular trend in the fitness industry. To choose the right person to learn from is a very important factor. 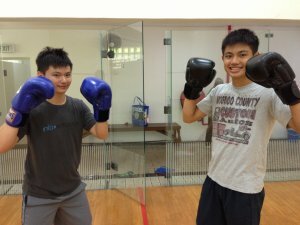 We make sure our Box-Fit training is fun and easy to learn. So beginners do not worry. Click here for a trial class now! Besides 1-1 personal training, we also conduct Thai Boxing group classes. Most clients that comes to us are from corporate companies especially for Team Building Programs. prices are reasonable depending on the number of pax (do contact us for quotes). Yes, we do have kids training classes. Clients can be as young as 8 years old to teenagers. To learn martial arts, its always good to start at a young age. Kids usually pick up the skills quite fast. Its the best time to learn when their body is developing. Its helps them in their coordination, balance, stability and focusing skills. Our high energy class is best suitable for children thats hyperactive. We make sure every lesson utilises their energy! Learning the art of boxing also makes them more discipline, teaching them how to show respect to others. From there, they will understand that it is wrong to use violence on others. A properly trained fighter will continue to stay humble. Also, young children gets bored easily due to shorter attention span. Learning Muay Thai is interesting as it consists of many different challenging movements. Every move is broken down into different segments for easy learning. Children will have a sense of achievement, moulding them to be more confident in life.